Here you can resolve any doubts that you may have. Send free personalized cards with your children’s calligraphy to family and friends. We offer an online card service so you can personalize them with your children’s handwriting. You can send them to school parent groups, congratulate a family member, create invitations… whatever you want. Give emotions with products created and customized with your children’s handwriting. Do you need to make a special gift? with our editor you will be able to customize our products using your children’s typography. Give special and emotional messages. Learn how to use your typography on a computer. We will we teach you how to install it. Download the diploma with your typography. You can print it and hang it as memory. 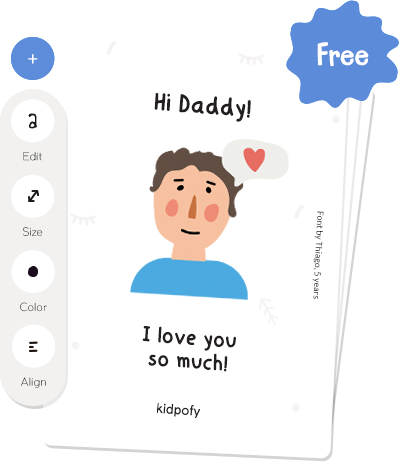 Kidpofy allows you to download a free diploma with the alphabet created by your child. childs into a typeface as a souvenir and use it? Would you like to write invitations with your calligraphy? be able to use the application.